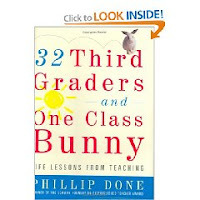 Ten lords-a-leaping chapters of enjoyment - - courtesy of Phillip Done's cute little book 32 Third Graders and One Class Bunny: Life Lessons from Teaching. Do you need a great teacher's gift? Are you a teacher? YOU NEED THIS BOOK! It is chock full of anecdotes, wisdom and humor from veteran teacher, Phil Done. It's definitely a very fast and heartwarming read. And hey, an autographed copy is today's Day 10 Giveaway! Have you seen the previous 9 Days of Christmas Giveaways? What are you waiting for?? Enter to win! ok not trying for this one - already own it. but just wanted to say in my past life as a 3rd grade teacher, this is the best book ever. so even if you don't win it you should totally go buy it for your child's teacher. i promise they will love it! I would love this book. While I am not a teacher, I have two handfuls that are in school. I think this would be a great pass on book to pass on if I won it. Of course I would read it first and probably laugh and cry and not want to give it away and hold onto it until the kiddos are in third grade...ummm...sorry for the ramble. Please enter me. Oh, this is my favorite one yet. A great giveaway. Signmeup! wow that sounds like a great teachers gift!! please enter me in! thanks! I'd love to gift this away to a friend of mine. Sounds like a good read, would love to win!! I can only imagine what fun little anecdotes will be in this. Kids crack me up. Have you already drawn? I hope not - I am just now getting all caught up! What a great gift for my teacher-SIL!